We're working on new blog content. In the meantime...check our our Instagram @arraeofstyle to see our latest updates. This is one of those projects we've had in progress before the official blog got going, so you may have seen some of the updates on Instagram, but I wanted to put an official post together with all the deets, because there's a lot of awesome going on in here. 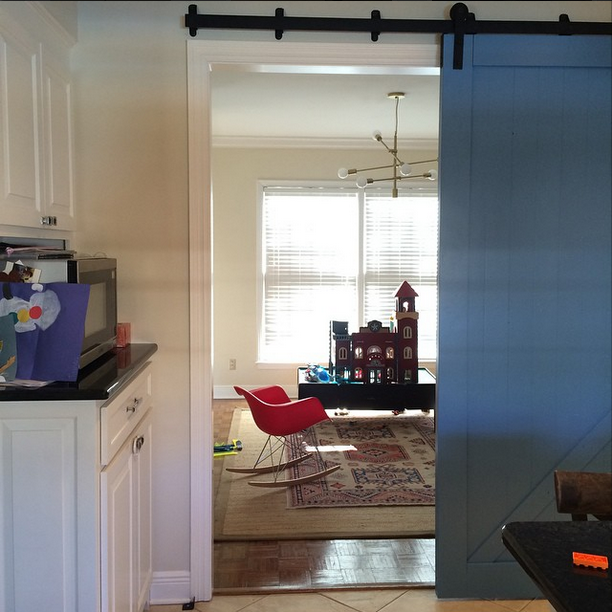 First we added a custom 8' x 8' Z-style barn door from Rustica Hardware and had it painted Cook's Blue by Farrow & Ball. The door is a total show stopper-it adds an awesome architectural detail and so much color to the open kitchen. It's also a great way to block the mess in the playroom if there isn't time to clean up before guests arrive. My clients don't have a mud room so when we first started discussing the built-ins (for the wall that currently houses the play kitchen) we knew we wanted locker style cabinets on the right for each of the boys to house their backpacks, school art, trinkets, etc. Since we got a new tv and sofas for their great room, their original green sofa and old tv would both come into the playroom. How dreamy is this new sofa going to be? Add in some fun pillows and drapes and we're talking major cool points for this room. Next we added one of my favorite budget lighting options, the Mobile Pendant from West Elm. 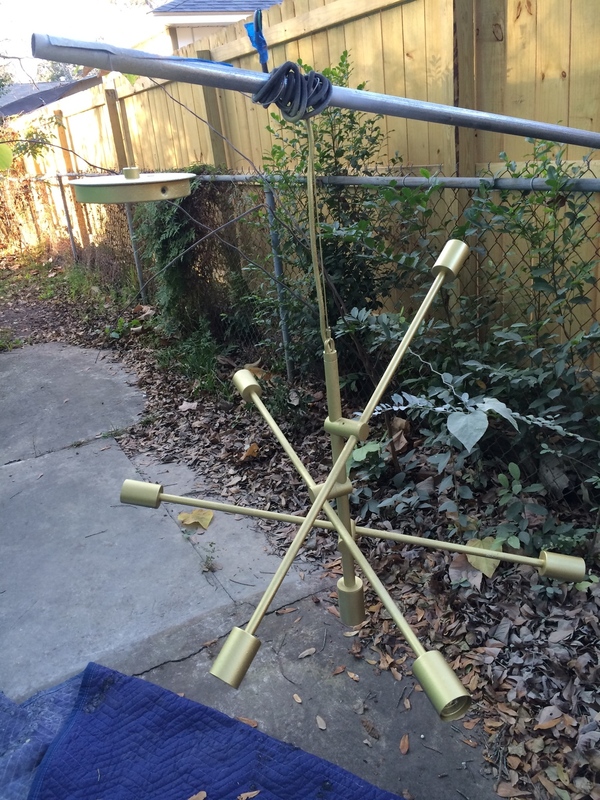 I love the mid-century modern feel of this light, but we wanted it brass for this room to match the library lighting we're going to be adding to custom built-ins down the road (see my sketch above). A little primer and my favorite gold spraypaint and this guy looks so much better for this room. Another client was getting rid of the kid-sized Eames style rocker, so I snagged it for this room. Next we painted the walls Snowdrop and the ceilings Balmy both by Sherwin-Williams. Light blue paint can be hard to pick because it can get real baby real quick. In order to keep it looking adult and crisp, try to pick the top chip on the card you like. In my experience, always go with a shade lighter than you think you want. Paint always tend to dry a little darker than the chip and this way you'll be pleased with the end result. Now we're caught up to where the room stands as of today. We're all painted and we just installed our new custom art. When we first started thinking art for this room, I knew I wanted something graphic and personal-- enter the idea of doing monogram. I started doing some research and found these awesome posters by The Freckled Owl on Etsy that looked like they were printed on navy linen. I reached out to the owner Kim and asked if we could just do the first letter of each of the boys with their full names spelled below. I had her print and cut them to fit the large Ribba frames from Ikea. Having them pre-cut to size made installation a snap. I centered them to the wall, in the boys birth order of course (Charley's the oldest, then James, then William) and centered the sofa to the art. These frames are only $25 each, are huge and have plastic instead of glass, which is great in case the boys are monkeying around on the couch and accidentally knock them. Up next, it's time for sofa reupholstery, pillows and drapes. Then built-ins in a couple months. Stay tuned to see our progress and follow #Calderwood on our Instagram to see updates on the whole house. I love it when clients are open to updating some of their existing furniture. It's crazy what a difference a couple quarts of paint can make. See how we brightened up this china cabinet! 1. Paint 2. Star light 3. Crib 4. Roman shade 5. Glider 6. Pouf 7. Floor lamp 8. Jute rug 10. Fabric- changing table cover. Dresser, lamp, oriental rug and art all client's own. Sometimes you meet clients in the funniest way and I was lucky enough to meet my C. Street clients at our mutual friends' wedding. We actually bonded over shooting clays before the rehearsal, but after chatting more, the couple confided in me they were pregnant with their first baby and were relocating to Washington D.C. I couldn't be more thrilled that they asked me to help with their nursery. A bit space challenged, the room is only 6' wide and 9' long, so we really had to strip it down to nursery basics- crib, glider, and a changing table. Like all good and prepared clients, C. Street sent me her Pinterest board of ideas and we got to churning out the perfect nursery plan. We knew we wanted this shaley-blue wall color and to have a collected feeling in the room, a mix of both modern and traditional elements. She has great art collected from both her and husband's childhoods which we're planning to hang in a gallery wall above the dresser/changing table. Since I'm usually never on site with my E-Design clients, correct measurements are key, so once we picked our pieces, I had her use painters tape to tape out the dimensions of the pieces to make sure our furniture plan would work. In a room this small, every inch counts! We're in the install phase now! So make sure to check our Instagram for #CStreet and follow along for updates. We'll of course keep you posted here too and show the full reveal here once the little prince has moved in later in April. 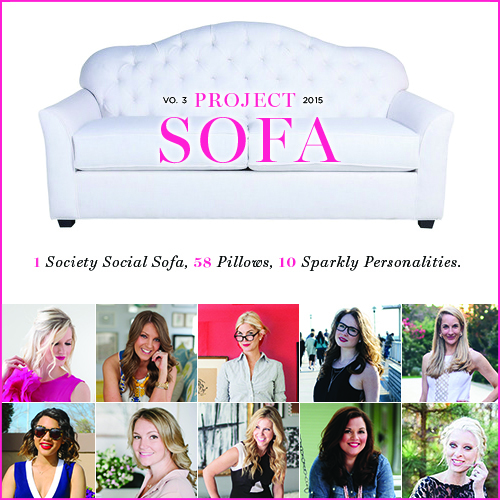 Society Social's Project Sofa 2015 look book is live and we're in it!- PLUS a $350 Society Social giveaway! I'm SO excited to finally get to share this news! 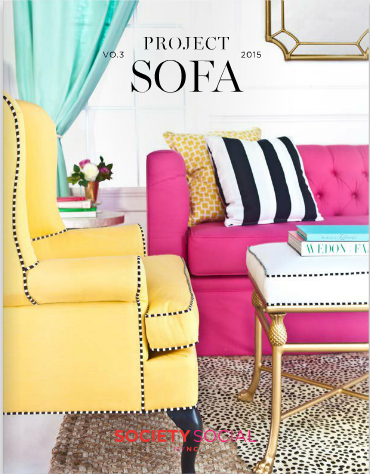 Society Social's annual look book is out on their website and also featured on Style Me Pretty Living. 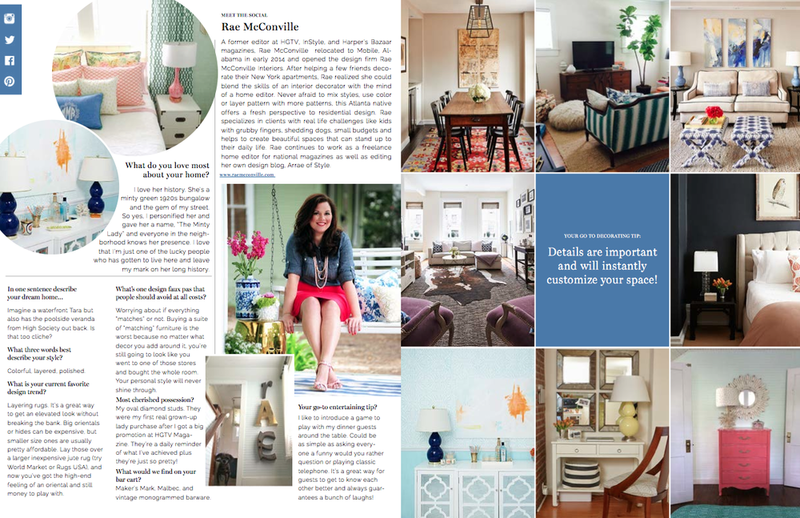 SS's chic founder Roxy Te Owens chose 10 top tastemakers to feature and I'm one of them! Pinch me please, is this really happening?